I hope everyone had a wonderful Valentine's Day weekend! I know Joshua and I had a lot of fun, and I cannot wait to show/share it with you! I am doing another Weekend Snapshot, but this time I am pairing up with Beth from Life With Bethie the Boo! If you don't know her, she was my featured blogger last time I did this! She is also posting a Weekend Snapshot today, so jump on over there and check out her weekend in Minnesota!! As for me in NC, here is a snapshot of what Joshua and I got into! 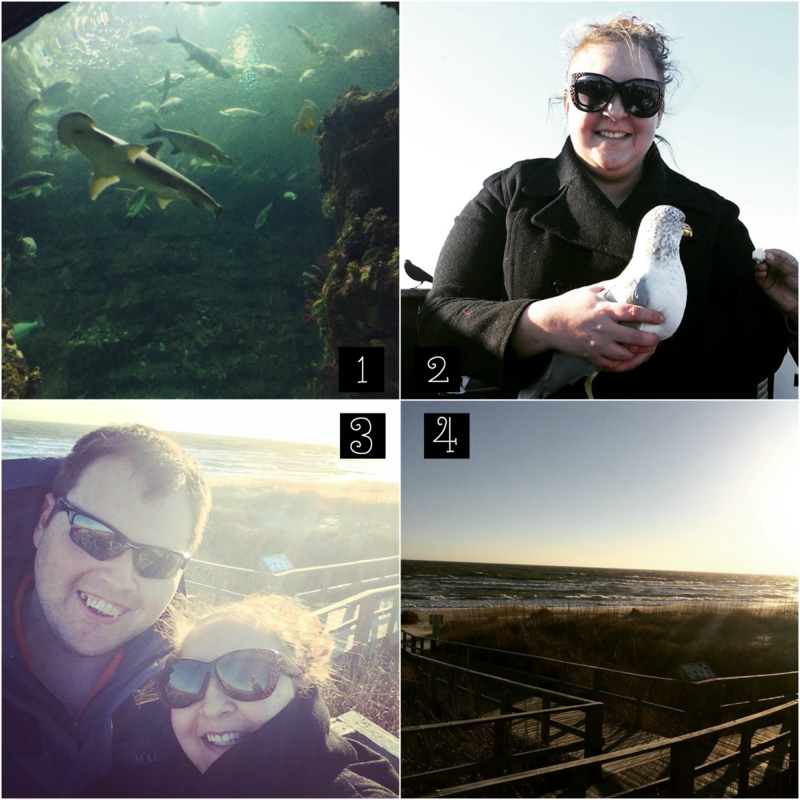 So Saturday, Joshua and I went to Wilmington to celebrate Valentine's Day and our three-year anniversary (Our anniversary is February 18). We always go to the beach for our anniversary, and it just so happened we went on Valentine's Day too! Now, some girls get chocolate and some girls get jewelry, but my man knows me best! He took me to the aquarium for Valentine's Day!! It was so much fun, and the NC Aquarium has touch tanks! I got to play with the starfish and stingrays, and we got to see sharks and turtles! All in all, perfect gift for me!! Also on Saturday (all of mine are on Saturday), Joshua and I took the ferry from Wilmington to Southport. We stopped by Target and bought our box of Cheez-Its, and proceeded to our usual Wilmington pastime. We love the ferry, and it is about a 30 minute ride to Southport, plenty of time to feed the birds! Now, Joshua and I had been together about a month when we first went to Wilmington and road the ferry. 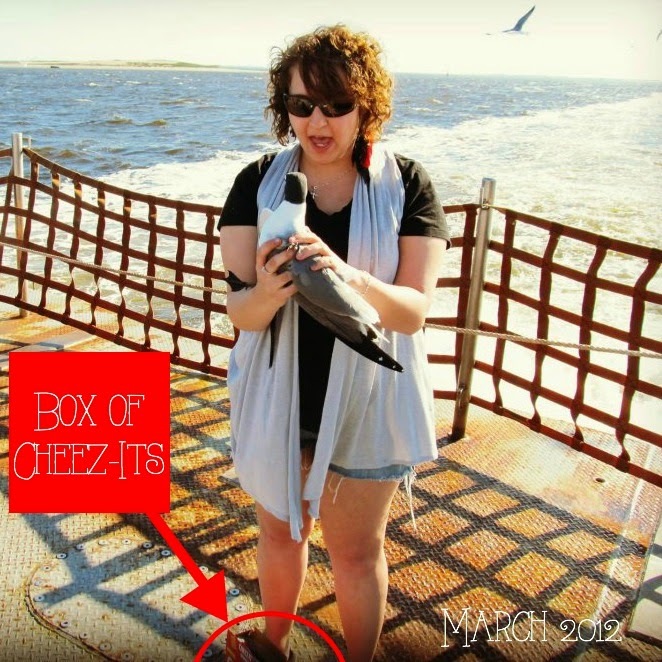 With a box of Cheez-Its, I snatched a seagull right out of the air, and I think that is when Joshua knew life with me would always be an adventure! Every time since, I have caught a seagull out of the air. You can see this pretty little beauty here as well as the other snapshots. This is honestly mine and Joshua's favorite place in the world to visit! We love Oak Island!! We stop here every time we go to Wilmington as well. For us, the waves and the environment is so peaceful. We can see the Bald Head Lighthouse from the shoreline, and the Oak Island lighthouse watches over us as we play in (or around) the surf. It is just perfect, and it is our little spot! This is an unusual sight for the North Carolina Coast. We normally watch the sun rise over the ocean in the morning, but this particular time, we watched the sun set into the ocean. I guess with the winter, the Earth moves just enough that we can watch the sun set over the ocean. It was the perfect ending to a perfect day, and after we left the beach we went to an amazing BBQ place! It was also a wonderful thing, and we are definitely recommending Southport Smoke House to anyone in the area!! Go and check it out! I am super eager to try making these watercolor mugs! I always seem to find the best reads on Pinterest, and this book looks awesome! Y'all no how much I love burlap banners!! Here's to get you super pumped about St. Patricks crafts! 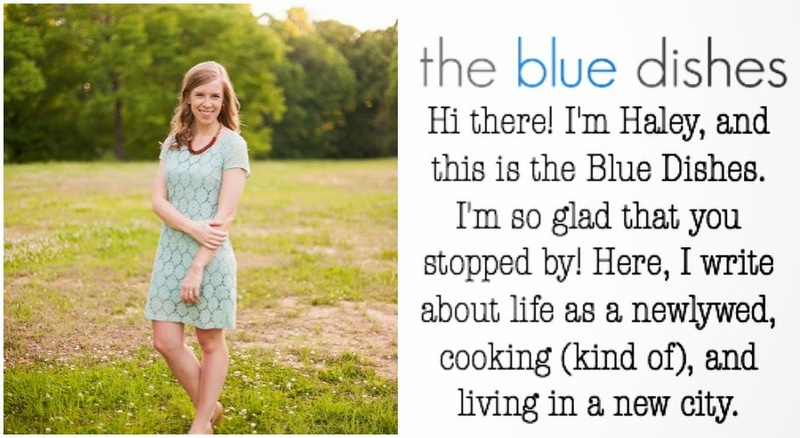 Haley from The Blue Dishes is one of my favorite bloggers! I love reading about her adventures as a newlywed, and y'all, she has some awesome stuff! If you get a chance, definitely jump over to her site and check her out! She is funny, and very outgoing! She is also a State grad, so Wolfpack...represent!! Definitely add The Blue Dishes to your Bloglovin' and stay up to date with all Haley's happenings! What all did you find this weekend?